Save $5.00 on any Avery Full Sheet White Mailing Labes (25ct or higher) or Clear Full Sheet Mailing Labels (10ct or higher) or Avery Full Sheet File Folder Labels. 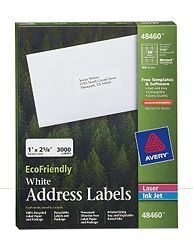 It’s been reported that Walmart has Eco Friendly Avery Mailing Labels for $4 per package. This coupon would score you some FREE labels. You should be able to print two of these coupons.